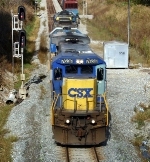 Description: CSX train passes through Anson, NC in 2002. 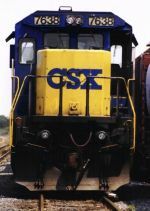 Description: CSX Q156 exiting DeWitt Yard. 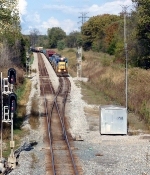 Title: CSX 7703 leaves Howell yard towards Henderson, Ky. Description: South Bound CSX on the Ohio River Bridge aproach. Description: Q217 departs Cumberland for points west; seen here passing the Amtrak station. Description: Q616 at Hamlet avenue. Description: A WB intermodal (Q117, Q115?) rounds the curve at MP 405 approaching the Donahue Rd crossing. Title: Train chasing at Calhoun. Description: Q108 is my first southbound of the day as they have clear track all the way south to CP5. Description: Q109 westbound at CP 293 passing the junction of the NYS&W on its left. Train has 282 axles. Description: CSX C40-8 7638 leads Q525 (Louisville Ky. to Nashville Tn.) through Glendale.